“There are many solutions as in pesticides that can be sprayed to kill the pests once they infect the crop but there was no actual solution that could actually tell the farmers the exact health status of their crops. 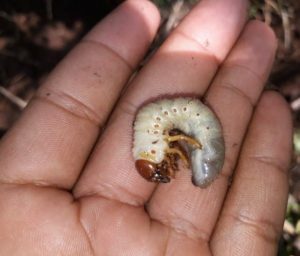 If only farmers knew that their crop is going to be infested with certain pest or disease then some precautionary measures could be taken. 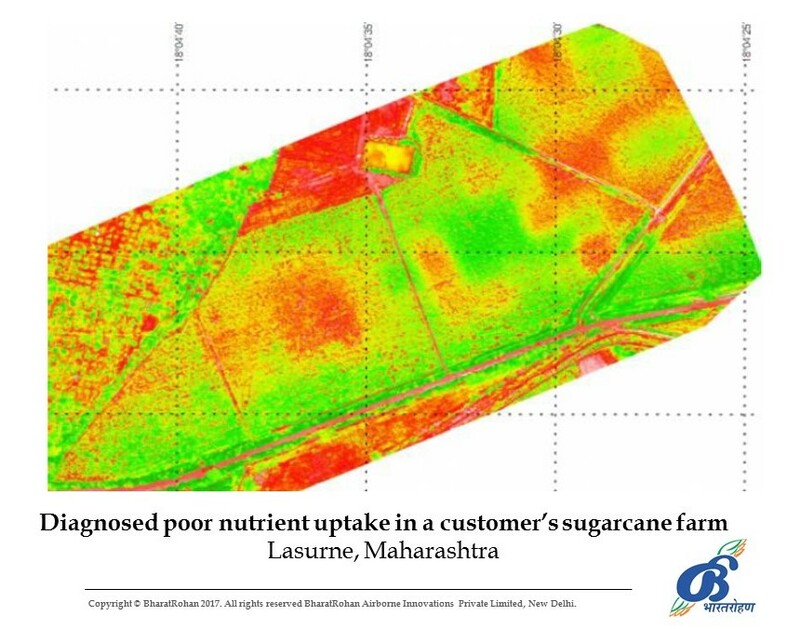 To resolve the issue we at Bharat Rohan Airborne Innovations, collect valuable data by flying our UAV (or drone) platforms equipped with hyper spectral cameras and transforms it into actionable information to generate early pest alerts, conduct crop nutrition diagnostics, detect weed anomalies and perform yield predictions. 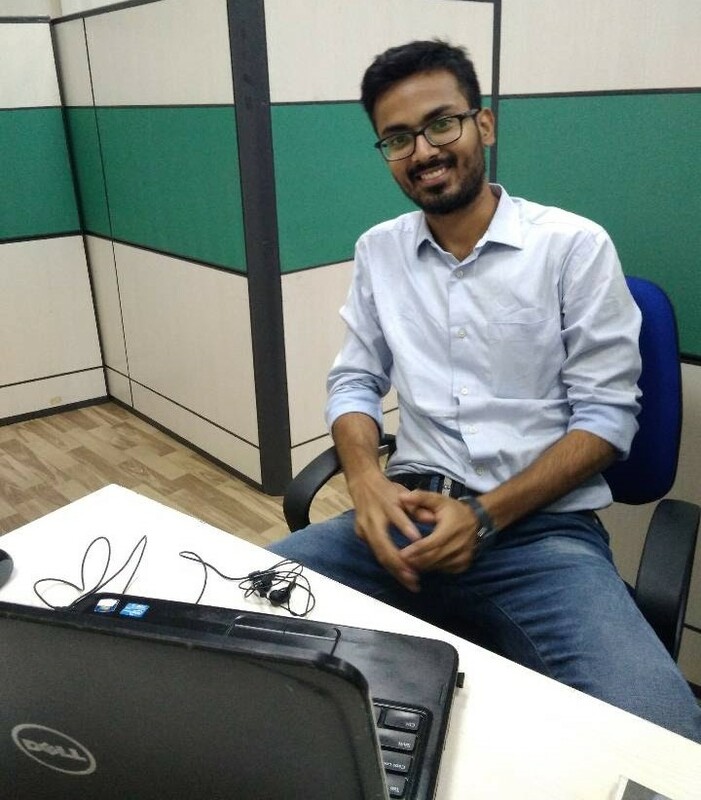 Thereby we assist farmers to safeguard their crops, improve the production and increase the profits,” Mr. Amandeep Panwar, co-founder and CEO, Bharat Rohan Airborne Innovations. 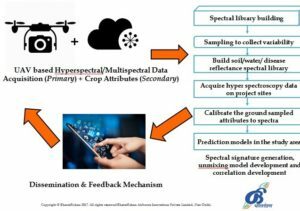 The problems prevailing in the farmer field is diagnosed by using non-destructive method of hyperspectral imaging and prescription maps are created. These prescription maps are then converted into recommendations reports in vernacular language of the farmers. The recommendations are provided by the agronomists/pathologist/entomologists and validated by ICAR and State Agriculture Institutes. In this way using the agri technology farmers are able to reduce their losses as pest attacks and disease outbreaks are identified at very initial stages that can be rectified by taking the corrective measures. Bharat Rohan Airborne Innovations was incorporated on June 2016 at New Delhi. It has branch offices at Hyderabad, Lucknow and Baramati. Company offers service based model wherein the end-user (farmer, farmer company, cooperative, NGO, food processing company or seed company) subscribes to their services for entire cropping season. “Our trained UAV Pilot conducts the aerial surveys equipped with sophisticated UAV/Drone based hyperspectral remote sensing methodology. The acquired data is converted into meaningful prescription/abundance maps pinpointing regions of potential damage or identified crop health status. These maps are then converted into actionable advisory in their vernacular. Depending upon the requirement, we also help farmers in implementation of the advisory and also in sourcing the inputs required in time,” elaborates Mr. Rishabh Choudhary, co-founder and CTO. When asked about cost-benefit ratio, Mr. Panwar says, “As per various researches, on an average, a farmer looses 20% of crops due to pest attacks and 15-20% due to mineral deficiencies. Then, he applies agri inputs which are not actually required. In this way we save atleast 10% of such losses. For example in sugarcane the average yield is 50 ton per acre and production cost is Rs. 2500/ ton (assumption). Then 10% crop loss saving through our services that can be calculated as savings of Rs. 12500/- per acre.” The fee for the service is charged per acre per crop season which is equivalent to just 30% of such crop saved. 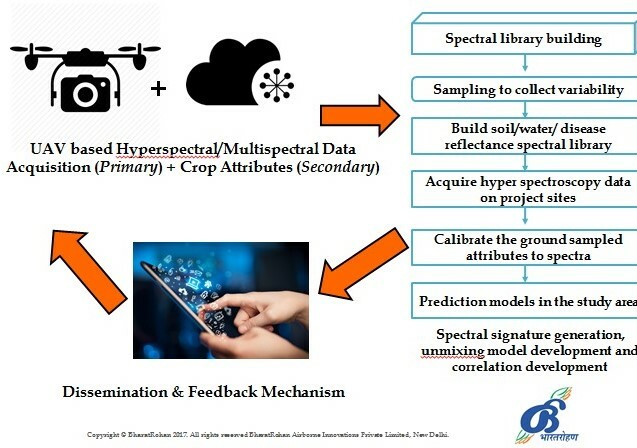 The technology used in identifying health status of crop is based on Hyperspectral Imaging which determines minuscule colour changes occurring in the plants due to physiological and phenological changes. “When a disease like bacterial blight infects a pomegranate plant, it is caused by a pathogen called ‘Xanthomonas Axonopodis PV Punicae’. This pathogen releases a number of effector proteins including TAL effectors into the plant its secretion system. This effector protein causes some biochemical change in the plants and leaves. With human eyes, these changes become visible only when the water absorbing red-brown spots become visible on leaves but with Hyperspectral imaging, we are able to identify the colour changes occurring in the leaves due to these biochemical changes – even at just the onset of the infestation which helps us in providing early predictions and forecasts to the growers so that losses can be prevented,” explains Mr. Choudhary. Speaking about data acquisition, Mr. Choudhary highlights, “Single UAV drone can collect up to 1000 acres of hyperspectral data every day. We visit our farmers’ farm once in every 7-15 days depending upon the rate of growth of the crop that helps us monitor every stage of crop and generate advisory in time which enable timely, accurate and precise actions.” In a single flying stretch 100-150 acres can be covered depending on wind and flight conditions. Both the founders studied Aeronautical Engineering in Lucknow and collaborated on many college level projects. With the common aim to solve the problems in agriculture using technology they decided to work together. 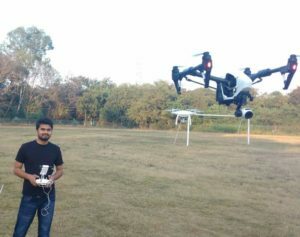 After incorporation of Bharat Rohan they started acquiring data from the UAv/Drone platforms that they had build in college and the spectral cameras. They worked on high value crops like pomegranate and then got incubated in a-IDEA which is the Technology Business Incubator of ICAR-National Academy of Agriculture Research Management, Hyderabad. a-IDEA helped them to partner with various ICAR institutes and provides access to great advisors and mentors. “We have unique partnerships with Hyperspectral sensor and camera manufacturers like Imec, Belgium and Bayspec USA. Also, we have strong relationship with CSIR-Central Institute of Medicinal and Aromatic Plants, Lucknow,” he informs. The prototype was developed for pomegranate crop in Kasindra, Rajasthan. Later the service model was commercially introduced in Baramati, Mahatrashtra for pomegranate and sugarcane crops. “Now we are working on other crops namely mentha, potato, mustard, paddy, wheat and sweat pea,” says Mr. Panwar. Company has recognizable presence in Uttar Pradesh, Telangana and Maharashtra. “We are covering 1000 acres for industrial farmers, food processing companies and seed companies. Even other farmers are ready to take our services as we are reducing the losses. Next we are planning to scale our operations to atleast 30,000 acres by 2020,” he adds.